Facebook has today announced changes to the News Feed aimed at making it easier to filter posts and find the information you really want to see. The new tools in News Feed Preferences let you do things like select specific friends or Pages, so that you always see those posts. You can also tap on a specific person with News Feed Preferences to see any new posts they’ve shared since you last logged on. Underneath the regular News Feed is shown. 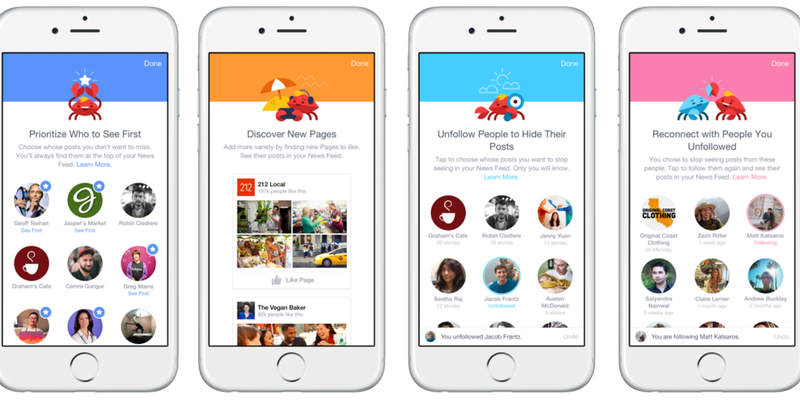 It’s also easier to find new Pages now, based on Pages you’ve Liked in the past. There’s an option to view the most popular people, groups and Pages that you follow (based on the previous week’s activity) and controls to easily unfollow any of them directly. It also keeps a list of them, in case you change your mind and want to re-follow. You can access News Feed Preferences by tapping ‘More’ in the bottom-right corner of the iOS app. The update will also be rolling out for Android and on desktop in “the coming weeks,” Facebook says. The change is an interesting one for a company that has relied heavily on its own algorithm to dictate the flow of your News Feed.